Thomas S. Monson is the new president of The Church of Jesus Christ of Latter-day Saints, it was announced today at a news conference in the Church Office Building. 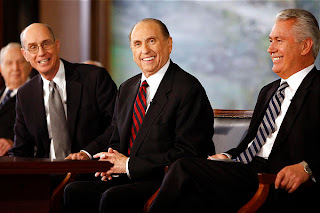 President Monson, 80, succeeds President Gordon B. Hinckley, who died 27 January 2008. The new world leader of the Church has called to serve with him in the First Presidency, the top governing body of the 13-million-member faith, President Henry B. Eyring, 74, first counselor, and President Dieter F. Uchtdorf, 67, second counselor.